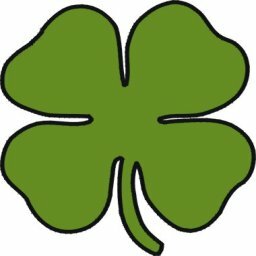 The drawing below is of a four leaf clover. This picture shows a human body that was chosen because of it’s shape. Now please examine this comparison picture of the four leaf clover and the human body for any similarities. while the buttocks and hip area form the other two lobes. 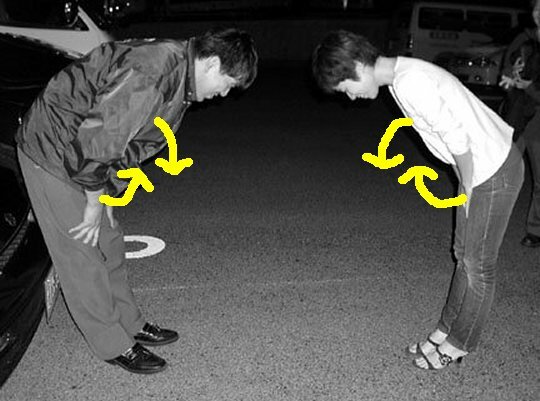 The next picture shows two people bowing towards each other. Bowing is accomplished be ordering various muscles to behave in certain ways. Using the concept of the human body being composed of four lobes, bowing would be accomplished by ordering the chest lobes to move down towards the buttock lobes, and ordering the buttocks lobes to simultaneously move towards the chest lobes. The lines in the next picture indicate the direction the chest and buttock lobes of each person are moving. The lines in the picture also indicate the direction of what the science of Physics calls “forces” within the body when the lobes move towards each other. The word “force” can be thought of as pressure, as in “the pressure of the body pushing the chest lobes down and the buttocks lobes up”. It is the nature of forces that they do not stop. The lines in the previous picture are short to help clearly visualize which direction the chest lobes and buttocks lobes are moving. In reality the forces represented by those lines continue along the path they are following. The red lines in this picture highlight the path the forces continue along. According to the laws of physics, “for every action, there is an equal and opposite reaction”. A force is an action so there must be equal forces and opposite forces that oppose the forces represented by the yellow and red lines. The blue arrows in this picture highlight the path of the equal and opposite force that the laws of physics state must be present for each of the original forces. down to a miniscule size. Now the system of opposing forces within the body of each bowing person can be easily seen. There are two equal but opposing curved lines on each person’s body. and the shapes are rotated until they are horizontal. The shape created by the capped force lines looks like an infinity sign. Why is it intriguing that the capped force lines form an infinity sign? There are people that believe the human body has what they call “energy”. They believe that the human body is connected to both the sky and the ground, and that energy circulates from the sky, to the body, to the ground, and then back up through the body to the sky. What if the purpose of bowing was not only to be polite to people, but also to form the human body into a configuration that was more conducive to the transfer of energy from itself to the sky and to the ground, by producing the bodily force pattern show in this picture? 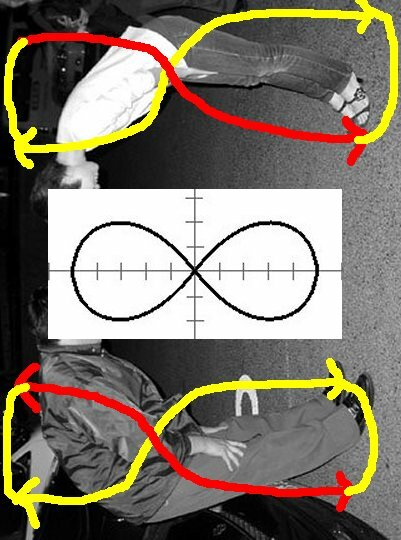 The fact the opposing force arrows can be changed into an infinity sign could be used to argue that this particular configuration of bodily forces, which is conducive to the infinite unending flow of energy from the sky, to the human body, to the ground, back up to the human body, then back up to the sky, was the inspiration for using the shape created by capping the pairs of force lines as the shape for the infinity symbol.